As a woman who claims New York as her birthright, I know one thing to be as certain as death and taxes: Time is money. And that, my friends, is my credo. Given this, I ask you, why hasn’t anyone figured out how to color a woman’s hair in 30 minutes or less? Why oh why must it take forever??? And by forever, I mean two hours, which is a lifetime by New York standards. Is this gorgeous red all Lucy's? Hardly, but who cares, when you're among friends--and fans? Now, I’m not sure what is meant, exactly, by the expression, “Time is money,” or who actually said it first, but I assume it was said by someone in a rush to get to Wall Street and meet with their broker before the stock market closed, in order to sell before the price of their shares plummeted. Don’t know if they ever made it, but either way, for them, time was, indeed, money. Well, I may not be on my way to Wall Street, but for me, time is always money. For, I am constantly in a rush and never have a moment to spare. Which is why I always dread when, every two months, I go and get my hair done. And by done, I mean, colored. Dyed. Grays be gone and all that. Yes, I am of that age (don’t be rude and ask me what age) that if I don’t do this, I’ll look, well, ancient. Something I’m not keen on, though come to think of it, I’m not keen on Botox, plastic surgery or tucks of any nature, thank you very much. It ain’t natural, but coloring my hair is perfectly natural. After all, women have been doing it for centuries, and that’s good enough for me. 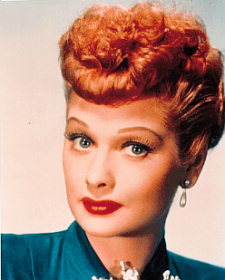 Do you think Lucille Ball was a naturally-endowed redhead? Don’t get me wrong, I loved Lucy, but the answer is no. Do you think Lady Godiva had long, golden locks thanks to Mother Nature? No siree, Bob! She had help from a little box of Clairol #323 or whatever they used in the Dark Ages. So here I am, getting my bimonthly fix of special effects low lights, highlights—the works. I need it all. Two solid hours of having my hair stylist work her magic while I sit anxiously counting the minutes until I can leave. If there was a way to drop off my hair and pick it up later, I would, because if there’s one thing New Yorkers despise, it’s sitting around doing nothing. Nothing, except contemplating what a time waster this really is, and how I have a pile of things to do waiting for me at home. Plus, I’m pretty sure Henry, my Cavalier King Charles Spaniel, who also happens to moonlight as my social secretary (though he’s yet to acknowledge that I’ve appointed him to this post) is not lifting a paw to help. As far as I can tell, he’s not doing anything but lounging around at home. Each time I return home—whether from work or running errands–I expect to see progress made on the to-do list I’ve given him. But all I see is one very cavalier pet, taking a nap. Grrrr. Someone has the life of Riley and it ain’t me. Talk about wasting time. Salon, I know it would be rude of me to cut Willow off, but trust me, it’s getting hard to resist. So, give it a rest. Today’s not a great day, and her cheerfully exuberant voice won’t make me feel any different. Fortunately for you, Salon, this is a battle I’m not willing to take on because, if you ask me, I simply do not have the time. So, is it just me, or are there any time wasters in your life? By all standards, I AM LAZY. I feel no shame in saying that, nope, none at all. In fact, if you gave me a banner saying “Ashley is lazy”, I’d take it and walk with it on top of my head through the street. I’m also a procrastinator, because I’m never ready to do anything at the right time. Somehow, it just winds up being put off until later, when my workload becomes so huge it’s either get started on it or be buried alive under it. Or go have some muffins and do it later. Ironically enough, I’m ever ready if it comes to roaming around town. Travelling is the one thing I’m good at and one of the few things I’m not lazy or lax about. Travelling means go go go go, and by all means, I’m ready to do that. Rushing around town is more fun for me than for probably anyone else I know. The one thing I hate…that is somewhat related to this, is when you call a phone company, and are put on hold again AND AGAIN. It’s really frustrating and annoying. And also quite boring and a complete and utter wastage of time. I mean, they transfer you from one section to another until you’re so sick of them you don’t want to cancel your heavily charged account anymore. The notorious AT&T once left me on hold for a WHOLE two hours. I love your comments about being lazy, lol! And I am totally with you on calling a company. I so hate all the options, particularly when they ask you to say it, and then the computerized voice doesn’t understand and you have to keep repeating yourself, when all you want is a live person! Sigh. It really is frustrating. My hair takes a long time too, Monica, especially when I wait three months in between colourings (usually two, but I’ve been on a reduced budget lately!). I had an inch-and-a-half of roots last week when I finally went! Timewasters: Commercials on TV! “Browsers” in the bookstore who wander around for half an hour, and end up not buying anything! Telemarketers! OMG, I have no patience for telemarketers, commercials and even browsers–don’t they have anything better to do?? Hi Monica. I saw you on Lady bloggers. It is sometimes tough to be pretty isnt it? Oh, I agree! And it does so make us feel and look better. I just wish it didn’t take so long. Sigh. I am horrified at the time wasters I have become addicted to this summer. When I was sick a couple of weeks ago, I began watching the Casey Anthony trial, switching back and forth to QVC. I am not a TV watcher but now I am hooked on the trial and watch it every day. When they are on sidebar,, I switch to QVC, where I actually bought some casserole dishes I probably don’t need. Is there a Twelve Step program to wean me off this stuff? Well, not the trial because I do intend to watch it until the bitter end, but home shopping? That is so not me…or it used to be. Help! I’m not at home during the day so I can’t watch the Casey Anthony trial, but I’ve been recording Joy Behar every night and listening to them dissect the trial each day. Absolutely fascinating, and yes, a bit of a time waster! Funny stuff, Monica, and so very true! I loved the image of dropping hair off at the salon, letting them work their magic on it, then picking it back up — that would surely free us busy people to do something else, wouldn’t it? Of course, who would want to wander around sans hair?? The salon would have to furnish rental wigs or paper bags or something! Another great post, mama! Love it! See, I love the two hour break to just sit there and be pampered. For me, it’s a chance to READ, THINK and check my emails without any interruptions. Serenity. I went some time without dying my hair, convincing myself that it didn’t matter. The grays are like “battle scars”. But, I couldn’t put it off for too much longer… I broke down and colored it. I’m too cheap (and probably too impatient) to go to a salon to get it done. I’ve done it a few times in the past, and… it’s too expensive and it does take entirely too long. As long as getting rid of the grays makes me feel better, I’ll keep doing it. It is expensive and I can only imagine how much I’m going to save when I finally do stop. Yikes. Thank you for validating what I’m talking about. Nice to see I’m not the only one with issues at the salon. Thanks, too, for stopping by today! Monica, I feel your pain except my hair grows so fast I have to go in every 5 weeks. And now all the pigment is gone (family trait- it’s white) so I’m in your territory- highlights, low lights etc. No more single process for me. Sigh. The only good news I have about my salon is I go in on Sunday and it’s just me and my sylist. No annoying phone and we can be as loud as want. As for the dog, it may be time for a talkin’ to. That kind of slacking off is NOT acceptable (but they look so cut doing it, right?). “Time is money” actually comes from ancient Greece from the phrase, ”The most costly outlay is time.” Since then it’s been repurposed for contemporary speech. I actually enjoy the whole 2-hour hair process. It’s the only “me” time I get. As a matter of fact, the thing the bothers me the most is my stylist making small talk. I don’t care, and you don’t care, what I have planned for this weekend. Let me sit here, absorbed in my iPhone, or computer, or book, or magazine. Leave me be. I’m swimming in “Lake Me”, and this is the only time I get. Wow, thank you for the factoid. I had no idea! And I agree about small talk. I do everything I can to discourage it. Time is MOST DEFINITELY money– and I 100% agree with you, time wasters need to snap out of it! Smell the coffee and get the world cranking like the rest of us are trying to! I tell ya, us “time is money” folks make the world go ’round! But I will say , I believe in taking slight pleasure in time at the salon because it truly is just time to yourself, that not many get to do (or afford, as Bella pointed out! )… I remember my single-working-mom coloring her hair in our bathtub from a Clairol box every so often, trying to maintain her dark locks even at a youthful age and I would cringe at the dye spots she’d leave all over the towels… and now that I get my hair done– I wish I could have paid for her to get those few hours of “her” time. But back to the point– time is money. And just like you told me when I was abroad “don’t sleep, you’ve got plenty of time for that when you’re dead”. That said, no wasting time… gotta get back to work! Hair coloring: can’t live with it, hard to live without it. I’m not very good at doing nothing whether I’m waiting for the doctor or my car or the vet or my take-out dinner. I tell myself to relax, but I’m always fidgety. I try to have a book around with me at all times, but my purse is pretty heavy without one. Maybe it’s time for a Kindle????? Well, I don’t 100% do nothing. I also end up flipping through a magazine and, more often than not, falling asleep. Great place to catch up on zzz’s! I hate going to the salon. I went to one of the “discount” salons two days ago for a cut. I left with a helmet head. You get what you pay for. By the way, I color my own hair. It doesn’t look as good, but I just can’t stand spending all of those hours in a salon. Incidentally, why can’t they make a shampoo sink that doesn’t feel like they are trying to break my neck? As you can see, I’m not crazy about it either. And you are so right about the sinks. They’re torture! You are so right about, “What?” My brother often answers the phone that way, and it somehow it puts you on the defensive, like you better have something important to say or get off the phone. Maybe it’s time all appointments are made online. That would be so much easier and I’m happy to report, my mechanic has already gone that route which so simplifies things as it allows me to schedule appointments when I remember: generally, in the middle of the night. Ok, ok, we can switch. Happy to, for you, madam! Monica – you are very funny. I don’t color my hair any more (see my post about sponsors I won’t be seeking). I have white hair, very thick, and it grows very fast. It has been gray since my 20s If I could go 2 months between colorings, I would still be coloring. However, I would have to go every week to 10 days for a touch up, my roots would be that white and visible. Unless I went platinum blonde, which is what I choose to call my natural haircolor, anyway, so coloring my hair would be a total waste of time (and money). There are many time wasters in my life. Like you, I don’t want to listen to the entire opening monologue of businesses I call. Nor their insipid automated menu. I don’t believe for a minute my call is important to you so please stop saying it. I also don’t like movie previews or trailers, I don’t know why – but I just feel like they are wasting my time. I bought a ticket, put on my movie!!! I don’t like waiting in the examination room for my doctor (whom I can hear through the thin walls of his new office I’m sure my insurance has single-handedly built for him). He is joking and laughing with either another patient or his ditzy medical assistant (believe me, she can’t even take blood pressure correctly, I have to show her how to do it every time), or both of them. The thought of their menage-a-trois gets my blood pressure skyrocketing. Then he tells me I need medication for hypertension. No, I need to not be kept waiting in various stages of undress, while you are entertaining in the next room. Lol! I don’t mind the trailers, but I do draw the line at commercials at movies. Good point about the doctor’s office, which is why all my doctors are female. I want someone who’s been there, done that, who can “feel” my pain. Ha! Yes, a little stimulus money will help them find a cure for coloring hair faster. Good thinking!